Aguas Danone de Argentina is a leader in the national mineral and flavored water market, with well-known brands such as Villavicencio, Villa del Sur, Levité, and Ser. Aguas Danone de Argentina is part of the Danone Group, world leader in the food and beverage industry, with products reaching 120 countries on 5 continents. The bottling plant located in Chascomús, Buenos Aires providence, Argentina, got its start by bottling mineral water. When it later started processing a variety of flavored waters there was a new demand to adequately treat its effluents after a significant increase in volume and organic load. With the increasing popularity of low carbonated flavored drinks, there was an increase in effluent volume and organic load at the plant. With the increased effluent, it was necessary to upgrade the plant to maintain the good working conditions in the two lagoons that received the treated effluent and, at the same time, comply with the permit limit for the final discharge in the Samborombón River located a few kilometers from the plant. In addition to the effluent produced by the production and bottling of waters and soft drinks, a significant concentration of organic load due to nonconforming final products contributes to the overall effluent. In 2006, Aeration Industries International’s local representative, Aeration Argentina, constructed a new wastewater treatment plant for the bottler. The original installation was designed for an effluent of 960m3 (253,605 gal) per day with 1,300mg/l BOD and 2,600mg/l COD. 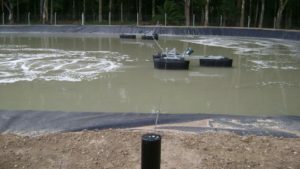 The plant design included an aerated equalization basin with pH control, a trickling filter, and an aerated lagoon equipped with four 10hp Aire-O2® aspirator aerators each mounted on a flotation system. In 2010, the plant experienced an increase in flow due to an increase in overall production and the addition of new products, such as energy beverages. The increase in production generated a flow over the design limit to the percolating filter, resulting in a need to bypass the flow straight to the aerated lagoon. To handle the overflow, the decision was made to increase the aeration in the lagoon. The existing four-unit system was upgraded to six units with the simple addition of two 15hp Aire-O2® aspirator aerators on float mounts. Both the 2006 solution and the upgrade in 2010 enabled the plant to consistently maintain effluent values within their legal permit and, at the same time, safeguard the health of the flora and fauna within the intermediary waterways. The 15hp and 10hp Aire-O2® aspirator aerators have worked seamlessly without any downtime since 2006 and 2010 respectively. The decision of Aguas Danone de Argentina to comply with the law, their commitment to protect the environment, along with the well-founded design of the wastewater treatment plant, safeguarded the treated effluent quality even during peak production conditions. According to Aguas Danone de Argentina, the Aire-O2® aspirator aerators are practical, easy to install and reposition within the lagoon without any difficulties when the time came to install an additional two units. The ongoing customer support from Aeration Argentina and Aeration Industries International, combined with the low maintenance demand from the units, have been key to the long-term success of the plant.